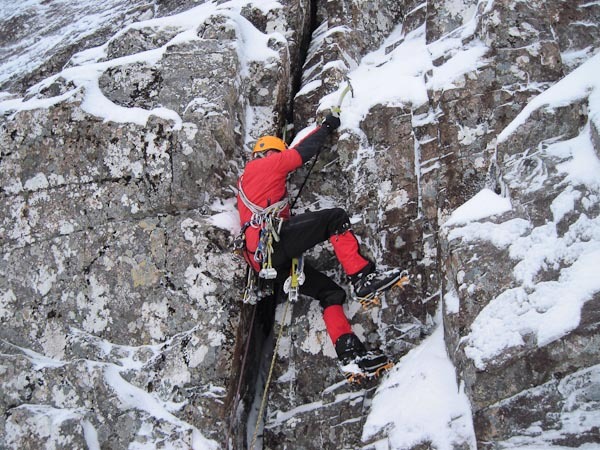 “I think all Scottish new routers dream of doing a new winter line on The Ben. Simon Yearsley and I finally got our opportunity yesterday. We’d noticed that the snowy weather had been coming in from the South-East so, along with Jim Higgins, we went up to Number Five Gully Buttress intent on the front face of the buttress right of Slanting Slit. Luckily things had gone to plan and the buttress was good and wintery. We started up the ‘nasty crack’ of Chicken Run (tasty in winter), climbed a more direct variant of the summer route’s second pitch to the great flake, and then broke up and right up a superb pitch of steep corners, narrow chimneys, and exposed ledges. As Jim said “it was as good as you get anywhere”. We all agreed it was one of the best mixed pitches any of us had climbed. The style is best described as ‘hard traditional’, full body contact sport in torrents of spindrift. An innocuous looking wall above turned out to be horribly awkward, and then a last blast up a groove in the darkness to the top of the buttress. This entry was posted in New Routes and tagged Ben Nevis, Jim Higgins, Malcolm Bass, Simon Yearsley. Bookmark the permalink.